Philae (lower right) was found Sept. 4 in a shadowy area of Comet 67P/Churyumov-Gerasimenko, marked in the image at left. The context of the landing zone is shown at upper-right. Philae's landing on Nov. 12, 2014 did not go as expected. After anchoring harpoons on the spacecraft failed to deploy, it made a triple touchdown before skidding to a stop in a shadowy zone. After nearly two years of searching, the European Space Agency's Philae comet lander has been found on the surface of Comet Comet 67P/Churyumov–Gerasimenko by the Rosetta spacecraft. Philae (shown in this close-up view by Rosetta) landed on the comet on Nov. 12, 2014, and was finally found on Sept. 2, 2016. The solar-powered lander was forced to rely on batteries to do its work. It sent just 60 hours of data from the surface, but made several findings in that short time – including detecting organics on 67P. Philae only made intermittent contact with Rosetta before the lander's mission was declared over this July, a year after Philae's last signal was detected. The new pictures show why it was so hard for Rosetta to get in touch after Philae's landing. The lander is resting on its side in a crevice, with two legs plainly visible in high-resolution imagery. This image from Rosetta's OSIRIS narrow-angle camera is the discovery image that finally spotted the Philae lander (which we've identified in a red circle at far right, near center). Rosetta began its search shortly after Philae's landing. ESA officials said that radio ranging data showed a suggested search area of several tens of meters. Rosetta imaged several possible objects. The team eliminated all but one target after the imagery was analyzed, among other techniques. However, a closer look had to wait until Rosetta shortened its orbit above the comet, towards the end of the mission. 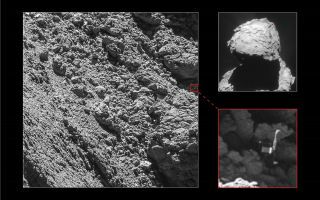 Confirmation finally came in images from Sept. 2, when Rosetta was just 1.7 miles (2.7 kilometers) above Philae on the surface. This annotated view shows how Philae finally ended up on the surface of Comet 67P as seen by the European Space Agency's Rosetta spacecraft on Sept. 2, 2016. A labelled picture from ESA not only reveals Philae's legs, but also some of its instruments and panels. Closer images will be possible when Rosetta descends towards the comet, ESA officials added. "This wonderful news means that we now have the missing 'ground-truth' information needed to put Philae’s three days of science into proper context, now that we know where that ground actually is," said Matt Taylor, ESA’s Rosetta project scientist, in the same statement. Rosetta – which isn't designed to land on the comet – will nevertheless touch down on Sept. 30 in 67P's light gravity. During descent, ESA plans to look at zones such as open pits in the Ma'at region, which could reveal more about the comet's insides. The orbiter's daring end is similar to NASA's NEAR Shoemaker descent on asteroid 433 Eros on Feb. 12, 2001. Like Rosetta, Shoemaker was not designed to land, but did so safely. While no images were sent after landing, the spacecraft continued sending data for two weeks after touching down. Follow Elizabeth Howell @howellspace, or Space.com @Spacedotcom. We're also on Facebookand Google+.Original article on Space.com.